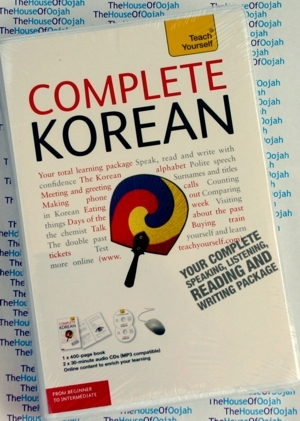 Are you looking for a complete course in Korean which takes you effortlessly from beginner to confident speaker? Whether you are starting from scratch, or are just out of practice, Complete Korean will guarantee success! Now fully updated to make your language learning experience fun and interactive. You can still rely on the benefits of a top language teacher and our years of teaching experience, but now with added learning features within the course and online.The course is structured in thematic units and the emphasis is placed on communication, so that you effortlessly progress from introducing yourself and dealing with everyday situations, to using the phone and talking about work. Extra online articles at: www.teachyourself.com to give you a richer understanding of the culture and history of Korea. Is this the bus for Tongdaemwun market? We bought that last year! Jae-Hoon Yeon, co-author, lectures in Korean at the School of Oriental and African Studies, London. Mark Vincent, co-author, studied Korean Language and Linguistics at SOAS. Koreanis the official language of both North Korea and South Korea. It is also one of the two official languages in the Yanbian Korean Autonomous Prefecture in China. There are about 80 million Korean speakers, with large groups in various Post-Soviet states, as well as in other diaspora populations in China, Australia, the United States, Canada, Brazil, Japan, and more recently, the Philippines. The genealogical classification of the Korean language is debated. Many linguists place it in the Altaic language family, but some consider it to be a language isolate. It is agglutinative in its morphology and SOV in its syntax. Like the Japanese and Vietnamese languages, Korean language was influenced by the Chinese language in the form of Sino-Korean words. Native Korean words account for about 35% of the Korean vocabulary, while about 60% of the Korean vocabulary consists of Sino-Korean words. The remaining 5% comes from loan words from other languages, 90% of which are from English. The Korean names for the language are based on the names for Korea used in North and South Korea. In North Korea and Yanbian in China, the language is most often called Chosŏnmal , or more formally, Chosŏnŏ. In the Republic of Korea, the language is most often called Hangukmal , or more formally, Hangugeo or Gugeo . It is sometimes colloquially called Urimal ("our language"; in one word in South Korea, with a space in North Korea).On the other hand, Korean people in the former USSR, who refer to themselves as Koryo-saram call the language Goryeomal . Korean has several dialects (called mal [literally "speech"], saturi, or bang-eon in Korean). The standard language (pyojuneo or pyojunmal) of South Korea is based on the dialect of the area around Seoul, and the standard for North Korea is based on the dialect spoken around P'yŏngyang. These dialects are similar, and are in fact all mutually intelligible, perhaps with the exception of the dialect of Jeju Island (see Jeju Dialect). The dialect spoken in Jeju is in fact classified as a different language by some Korean linguists. One of the most notable differences between dialects is the use of stress: speakers of Seoul dialect use stress very little, and standard South Korean has a very flat intonation; on the other hand, speakers of the Gyeongsang dialect have a very pronounced intonation. It is also worth noting that there is substantial evidence for a history of extensive dialect levelling, or even convergent evolution or intermixture of two or more originally distinct linguistic stocks, within the Korean language and its dialects. Many Korean dialects have basic vocabulary that is etymologically distinct from vocabulary of identical meaning in Standard Korean or other dialects, such as South Jeolla dialect /kur/ vs. Standard Korean /ip/ "mouth" or Gyeongsang dialect / vs. Standard Korean / "garlic chives." This suggests that the Korean Peninsula may have at one time been much more linguistically diverse than it is at present.. There is a very close connection between the dialects of Korean and the regions of Korea, since the boundaries of both are largely determined by mountains and seas.